Topics: Policies, Banks, Bar Accessories & Barware, Beach Towels, and Boxer Shorts. The site has about 23 users daily, viewing on average 1.50 pages each. Clearblue Technologies (Massachusetts, Andover) is the location of the Apache server. 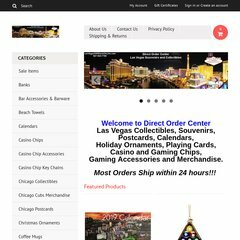 Lasvegasgiftstoreonline.com's IP address is 207.211.91.32. It has 3 DNS records, dns2.prostores.com, dns3.prostores.com, and dns1.prostores.com.